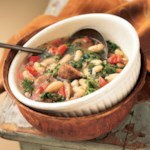 A pound of dried beans is the inexpensive foundation for this simple, hearty meal. 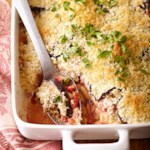 Serve it with slices of whole-wheat bread or a side salad for a complete and satisfying lunch or dinner. Pick over and sort beans, then rinse under cold water and transfer to a large bowl. Add 3 quarts cold water, cover, and soak at room temperature for 8 to 24 hours. (To quick-soak, see Tip.) Drain and rinse the beans. Heat oil in a large pot or Dutch oven over medium heat. Add onion, carrots, and celery; cook until starting to soften, about 8 minutes. Stir in garlic; cook until fragrant, about 1 minute. Stir in broth, water, the soaked beans, bay leaves, and Parmesan rind, if using. Increase heat to high, bring to a boil, and cook for 5 minutes. 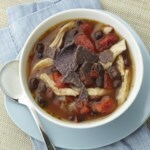 Reduce heat to low, partially cover, and simmer until the beans are nearly tender, 45 to 50 minutes. Stir in kale, tomatoes, and rosemary. Partially cover and continue to cook until the beans are tender, 30 to 45 minutes more. Discard bay leaves and Parmesan rind, if using. Stir in vinegar and salt; season generously with pepper. 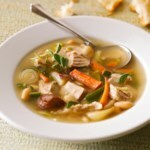 Tips: Adding a Parmesan rind to a pot of soup adds a subtle savory flavor. You can cut off the rind of any size block of Parmesan and save it for future use; rinds will keep in the freezer for 6 months. 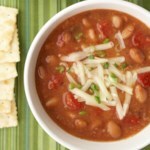 To quick-soak beans: Place beans in a large saucepan with enough cold water to cover them by 2 inches. Bring to a boil. Boil for 2 minutes. Remove from the heat, cover and let stand for 1 hour. This was easy and flavorful. I used a pressure cooker. I sauteed the veggies then added the rest of ingredients. I used 2 cans cooked beans instead of uncooked. I cooked on high for 10 minutes and natural release for 10. It was perfect. Next time I would cut back on the water just a bit. I make a very similar soup using canned beans. 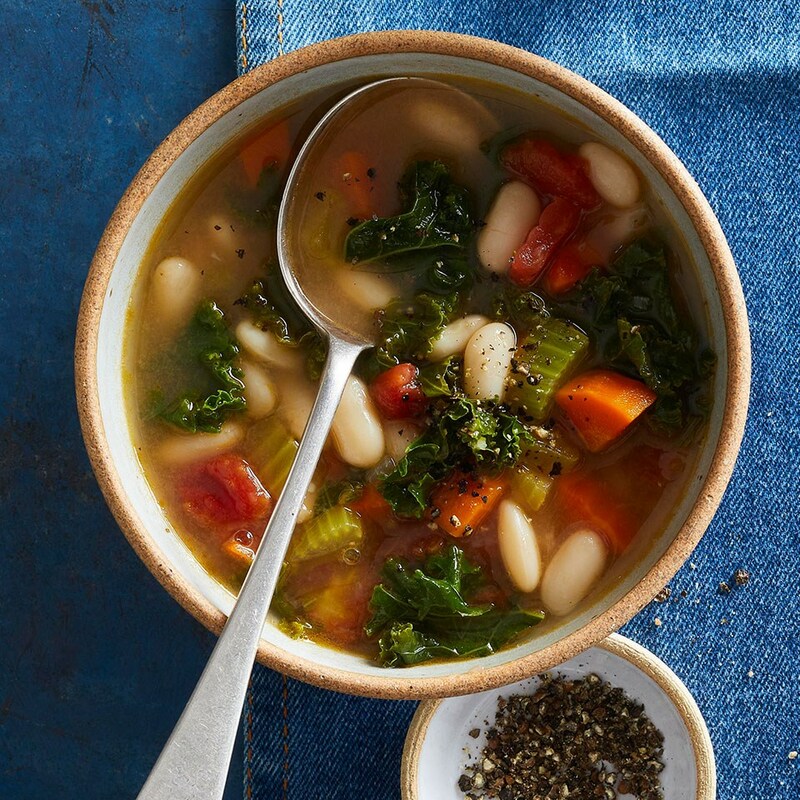 I put 1 can of rinsed cannellini beans into the soup but I pulverize a second can of beans in a food processor (or just mash them by hand), then add that to the soup to give it a slightly thick and creamy texture without adding any cream. To really add some extra flavor, add a small amount of Canadian bacon or lean ham (low fat) cut into pea sized pieces and just a bit of liquid smoke to really punch up the flavor. 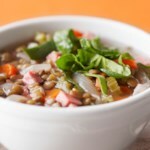 Delicious and healthy soup!